Do you like to solve problems? Would you like to go into an engineering field? Would you like to get into a good college? Do you like understanding and quantifying the world around you? Are you up for a rewarding challenge? If you said yes to any of these questions, then Fundamentals of Physics is the course for you. We start of with three basic units and some simple concepts to build our understanding of the physical world. We look into motion and what causes it, energy, momentum and fluids, each ideas we interact with on a daily basis. We solve real world problems and apply the concepts to we learn to the homework sets. Join me as we take look at what "makes the world go 'round." A brief introduction leading to the basic concepts that describe motion such as velocity and acceleration. In the document section of Motion Lesson 1 there is a homework problem presented that challenges you to solve for the minimum length of a runway. This lesson provides the video describing how to solve for the minimum runway length. In This Lesson we finish solving a problem started in Motion Lesson 1 and solve an additional 1D Motion example problem. This lesson shows the solution to the homework problem given in the Motion Lesson 1 Conclusion lesson. We see two cars travelling at one another and solve for the time it takes for them to pass one another. Video lesson explaining the solution to the homework problem provided in Motion Lesson 2. A person throwing a ball against a wall accidentally hits and breaks a window. We find the height of the window given the initial speed and angle of the ball. Two problems in 2 Dimensional Motion are solved. The first analyzes the minimum and maximum speeds of a volleyball sere are determined. In the second problem we see how gravity will pull an arrow off course on its way to a target. The file includes problem statements for 1 and 2 dimensional motion and the video file will provide step by step solutions for each problem. Newton's Laws are introduced and a focus on Newton's Second Law and it's importance is discussed. A simple example of a falling object is shown and a couple of other force and motion problems and solutions are shown. A man uses a pulley to pull himself up an incline, gaining a mechanical advantage. The siolution to how much force is required to pull himself up the incline is determined. Work is defined, the Work energy Theorem is derived using Newton's 2nd Law and a simple example problem is solved using the Work energy Theorem. A car skids to a halt. Friction does work to slow the car. The work energy theorem is used to find out how much work is done. The Law of Conservation of Energy is added to the Work Energy Theorem as another powerful tool to solve problems. A sailboat has work done on it by the wind and by drag. The Work Energy Theorem is used to find the final speed of the boat. Two ice skates initially at rest push off of one another. We analyze this situation using conservation of momentum. 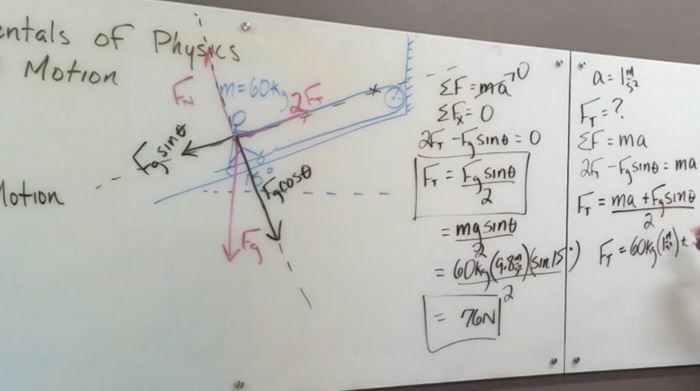 This course covers the basic fundamentals of physics including basic units and problems in Motion(Kinematics), Force and Motion, Work and Energy, Momentum and Fluids. There are over 7 hours of video instruction in 28 video lessons with an additional 3 hours of videos showing detailed solutions to problems provided in the sections. This course begins with the basics of One and Two Dimisnional Motion(Kinematics) such as speed, velocity and acceleration. It then introduces Newton's 3 Laws of Motion and how to use Newton's 2nd Law to find out what causes motion to occur. After this, students discover how force, which causes motion, can do Work and change the kinetic energy of an object. From here, students are taught the Work Energy Theorem and how to apply it. The Law of Conservation of Energy is introduced and students learn how to apply this powerful law to solve a myriad of physics problems. Finally, the world of Fluids is discussed and Bernoulli's equation is introduced as a powerful method to attack many real world physics problems. Students see how each concept taught, beginning with 1 dimensional Motion, builds on the previous concepts to help us toward a deep and meaningful understanding of the Physical World. You will find a homework assignment in the last lesson of each section and a video of the solutions to the homework is found in that lesson as well. Quizzes are available for most lessons and you will also find a couple of sample documents that show in depth problems and solutions to those problems in selected lessons. By the end of this course you will know how to solve problems using math and physics concepts from each of the major course sections. Major sections include Motion(Kinematics), Force and Motion, Work and Energy, Momentum and Fluids. Issues I care about: I want the youth of our country to be prepared with the skills necessary to succeed in college and beyond. I believe in hard work, perseverance and the power of people working together toward a goal. I have had a wonderful working career, first as an Engineer, then a Financial Advisor, followed by Physics Teacher and now an Integrations Engineer. I love learning and teaching. In 2007 I was named Teacher of the Year and was awarded both the Amgen Award for Science Teaching Excellence and the Toyota Tapestry Grant. I was also awarded BP/Arco's A+ for Energy two consecutive years. Physics is my passion and I also love engineering design and programming. This document has the solutions of the quizzes found in the lessons of Fundamentals of Physics. In cases where a solution requiring equations is necessary, the problem will have the necessary steps shown for clarity.